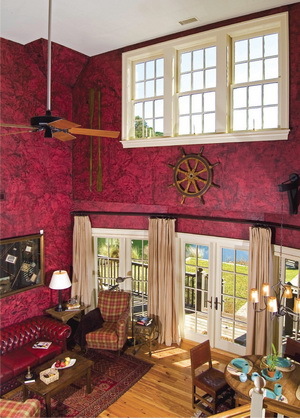 Beside the shores of Lake Sharon on rural Johns Island, South Carolina , builder Steve Koenig, owner of Steven J. Koenig Construction Company, has created a spectacular guest cottage aptly named "The Boathouse." Koenig's plan when he began to develop this 900-acre retreat at Briar's Creek was to take advantage of an array of indigenous wildlife that would make Noah proud. 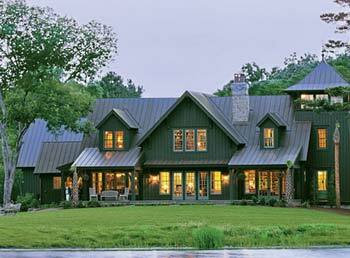 The Boathouse, built adjacent to his magnificent main home, serves as the guest house for Steve and his wife Julie's friends and family and is nestled on a bucolic tract of land that is a nature lover's dream. Ancient live oaks, abundant wildlife and the myriad of activities that Lake Sharon offers summon those who love the outdoors and garner a greater appreciation for nature - exactly what nature-loving Koenig sought to achieve. For those who are also passionate about golf, the Rees Jones-designed Golf Club at Briar's Creek, the only course in South Carolina designated a Certified Silver Audubon Signature Sanctuary, is only a 3-wood away. Actually, the Boathouse was built before the Koenigs' main residence was completed. It served as the perfect venue for Steve to kick back and relax after a long day's work and enjoy nature unfolding before his very eyes. However, the Boathouse is not simply a lakeside cottage but a wonderful, custom-designed work of art that truly enhances the surrounding natural environs. Two verandas command a striking view of the area, where you can hear the cry of the eagles that circle the lake in hopes of catching their dinner. One veranda overlooks an impressive brick fireplace and the adjacent poolside lounging area, where, if you stop and reflect for a moment, you can almost hear the crackling of logs on cool moonlit evenings and certainly smell the fragrant pine trees in the nearby woods. The other veranda is so close to the lake that you just might find yourself eyeball-to-eyeball with a largemouth bass. Well, perhaps that is a bit of a fish story, but what else would you expect in such a serene setting? The cottage's main living room is accented with a cathedral ceiling, giving the impression that you might have just entered a New England ski chalet. Glass doors frame a breathtaking view of the lake and a stairway leads to a balcony that offers a stunning panoramic view of the room below. The second bedroom is upstairs, where the subtle elegance of a small balcony and many windows allows guests a restful interlude from the burdens of the day. The downstairs galley-type kitchen, which cleverly opens up to both verandas, has all the accouterments needed to prepare hearty home-style meals. What cook would not be inspired to create culinary masterpieces while gazing out on the tranquil water's of the nearby lake. For the nautical-minded, a boat slip provides the opportunity for fun-filled excursions on Lake Sharon, such as a day of fishing, taking in the breathtaking sunsets or simply dozing off while listening to and feeling the soothing waters lap against the boat. The Boathouse is a testament to the ingenuity and talents of Steve Koenig and his staff, and, for the lucky guests and visitors who get the chance to enjoy its charms, it's a once-in-a-lifetime experience.